The Borough of Export is excited to announce the preparation of a Master Plan for a new park in the heart of town. JM Hall Jr. Park is located on the former site of the Export No. 2 Mine off Old William Penn Highway, next to the American Italian Club, and within easy walking distance from downtown Export. 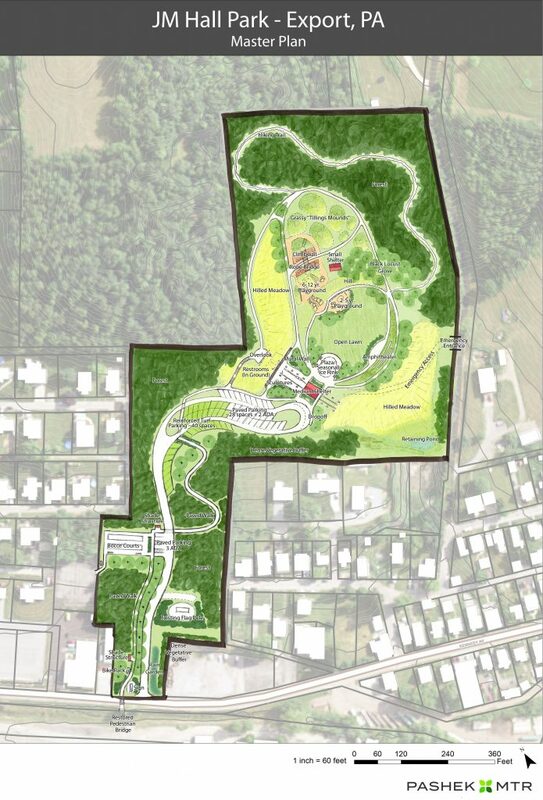 The park will aim to connect locals and visitors to the rich history of Export’s founding, former coal industry, and landscapes. The park will be centered on a plaza simulating features of the mine during operational years. Restrooms inset into the hillside paired with a mural will give guests the illusion of walking into the mines. Extending across the plaza from the restroom “mine entrance” will be rail car tracks and a structure replicating the remnants of a tipple, just as an actual tipple once extended out over Old William Penn Highway. A picnic shelter is incorporated into this interpretive modern-day tipple structure, appearing to be a section of tipple with metal roof still intact. Adjacent is a seasonal plaza which converts to an ice rink during winter. 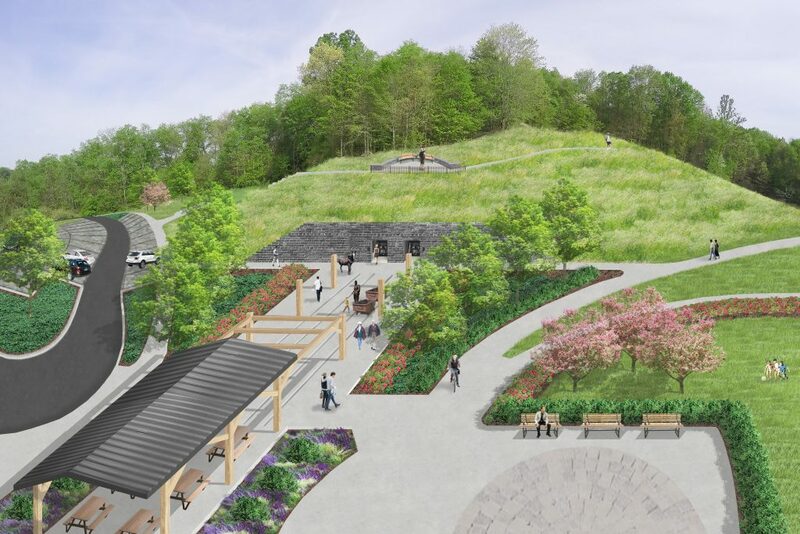 A quarter mile scenic loop trail will extend from this plaza, connecting visitors to an open recreation lawn, amphitheater, nature playgrounds, vistas, a second picnic shelter, historic panels, and a woodland hiking trail. Interactive historic references include passing through a black locust tree grove, once used to provide supports for the mines, and recreated grassy tailing pile hills. Nature playgrounds include embankment slides, climbing rocks and logs, a sand pit, small tunnels, and a large grassy “tailing pile” with climbing features and a slide. JM Hall Jr. Park will be capable of hosting small festivals, family reunions, picnics, and school groups. With the development of the regional trail along Turtle Creek to the entrance of the park and the new community park, visitors will stop and patronize the nearby local businesses during their visit. With the completion of the Master Plan in the fall of 2017, efforts will shift toward funding the construction of this wonderful park. Once built, JM Hall Jr. Park will join the other unique assets of Export, attracting both existing and potential families.